2013 was a wonderful year for Belle Fleur. We were able to design some truly gorgeous weddings, and work with some of our favorite vendors at beautiful venues. The amount of variety was stunning. Color schemes from all shades of white to vivid brights; and bouquet designs as traditional as cascades to free-form, garden style, hand-tieds. Joan's wedding bouquet. Photo by Belle Fleur. We were also involved in a fair amount of travel. First, it was off to Kansas City last May to design and celebrate, my sister-in-law, Joan's, wedding. Her bouquet was a stunning spring mix of roses, hydrangea, stock, veronica and lisianthus finished with a mix of hosta leaves at it's base. The summer wedding season flew by and we started into our fall season, which is quickly becoming the busiest time of year for Belle Fleur. Last September took us on another trip out of town to Boulder, Colorado. Our niece Sarah's wedding date happened to coincide with the 500 year flood that hit last year . . . It was quite the adventure. - Sarah and Steve's basement apartment flooded two nights before the wedding. Inside were the wedding rings and the marriage license; not to mention their two cats and huge collection of books. - The kitchen of the restaurant that was supposed to host the rehearsal dinner flooded. - Estes Park, where the ceremony was to be held - you guessed it - flooded. - All of Sarah and Steve's friends and family were already in town so they had tons of help clearing out what could be salvaged from their apartment. The ring and marriage license were floating on the coffee table in the living room, and their two cats were riding it out - literally - on the bed. Sarah and her handsome father, Gary. Photo courtesy of Ryan Dearth Photography. - The day before the flood, Sarah's sister, Ellen, moved Sarah's wedding dress to a condo that had been rented for the wedding (premonition, anyone?). - Sarah works at the St. Julien hotel in Boulder. Because of the flood, the hotel had a cancellation for a large party that was to be held the night of the rehearsal dinner. Guess who got the room instead? Gorgeous venue and great food! - The Boulder Museum of Modern Art agreed to host the ceremony in the main lower gallery, as Sarah and Steve had already rented the upstairs for their reception. - While taking photos after the wedding in a nearby park, they were interviewed by a local news crew and ended up on the Today Show the following morning. Photo courtesy of Ryan Dearth Photography. Oh, by the way, just prior to the wedding, Sarah and Steve had just purchased their first home together, so they didn't have to return to the apartment after their honeymoon. If these two can weather life's actual storms, the rest of their married life should be a cakewalk! 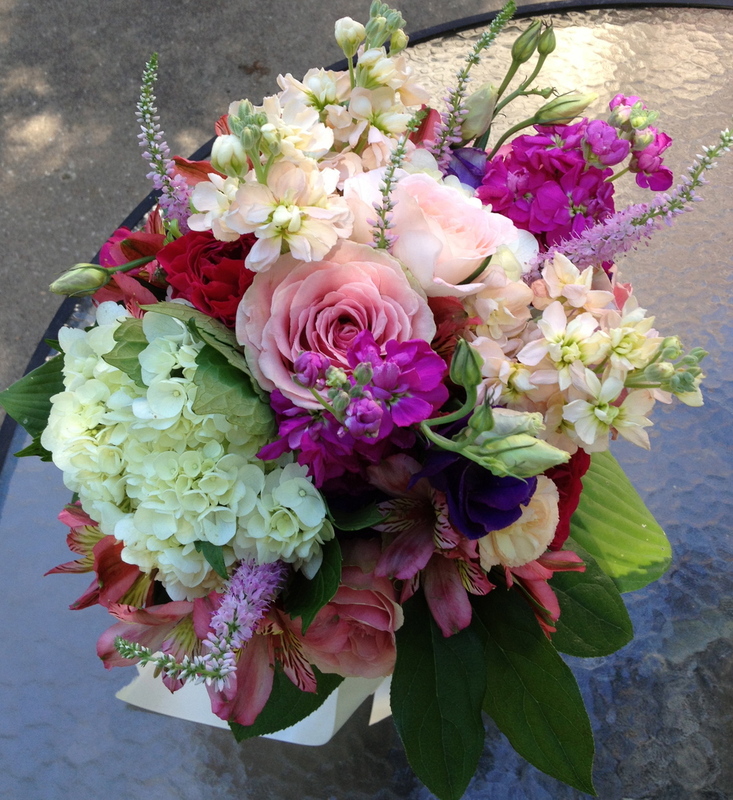 Garden roses, Sahara roses, dusty miller and lotus pods were carried by our bride at Cedar Lake Cellars. Winery weddings were big last year! Locations such as Wine Country Gardens, The Yellow Farmhouse Winery, Chandler Hill Vineyards, and Cedar Lake Cellars all provided lovely backdrops for the festivities. Friends, family, a beautiful setting and wine. Who could ask for anything more? New bride, Janell Embry, at the Yellow Farmhouse Winery. A homemade, rustic chuppa, decorated with flowing swags and garlands at Chandler Hill Winery.